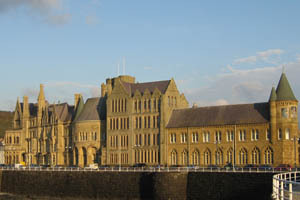 Aberystwyth is a busy and interesting coastal town on Cardigan Bay. Its status as the administrative centre of Ceredigion is enhanced by the highly-rated University, the National Library, promenade, 2 beaches and a Cliff Railway leading to the site of the unusual Camera Obscura. It provides plenty of family activities, a variety of cafés and bars, castle ruins, a farmers’ market and the Ceredigion coastal path. 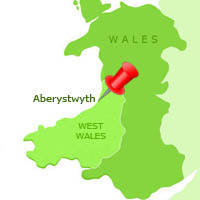 Accessible via the scenic coast road or from the east by mountain road or rail, Aberystwyth provides the first tantalising glimpse of the sea for visitors arriving from the Midlands. A far cry from the brutalist architecture of 1960s university design, The Old College building on the sea front is a true marvel of Gothic Revival architecture. Originally intended as a hotel to accommodate the crowds of wealthy tourists who were expected to flood into the town on the new railway in the 1860s, its completion was thwarted by bankruptcy of the over-optimistic developer. It is hoped that he might have gained some small comfort from knowing the noble destiny of the building: it was sold to a group of philanthropists who were determined to establish the first Welsh university. Starting out with a teaching staff of three and only 26 students, the university went on to make a name for itself in many areas – not least among them being the fact that it was one of the first to admit female students. 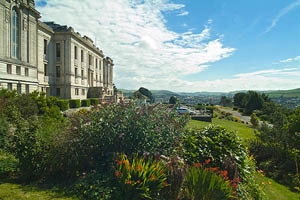 The large modern campus, now situated on the steep hill leading inland is home to a thriving Arts Centre with cinema, theatre and exhibitions – well worth a visit at any time of year. The National Library of Wales is much more than a library: it hosts art exhibitions, talks and other events and even has two cafés and a shop, so you can spend an entertaining and cultural day there. There is no shortage of good and varied food with numerous cafés, bars, and restaurants including Chinese, Indian, Italian, and Mediterranean cuisine. Enjoy the many local products at the local farmers’ market held on the first and third Saturdays of the month. On Pier Street, just up from the promenade, Ultra Comida, a Spanish delicatessen with tapas bar has shelves stacked to the ceiling with delicious cheeses, cured meats, olives… all making for an irresistible snack or meal opportunity. The café at Aberystwyth Arts Centre serves a delicious selection of lunches which include tasty vegetarian options and the huge glass-fronted building offers splendid views of Cardigan Bay. Walk into The Tree House on Baker Street in the town centre and you will not want to leave for several hours. Experience suggests that it’s wise to arrive early for lunch - served between 12 and 3.30. You can also take breakfast or afternoon tea between 10am and 5pm. The menu is sensational in its originality and the “daily specials” mean you can sample a wide range of dishes made from local and organic produce which is also stocked in the shop on ground level. Catering for carnivores, vegetarians, vegans, gluten-free, wheat-free and other specific diets, the chef is very versatile although cannot guarantee nut free meals. The Ceredigion Coastal Path stretches for 63 miles along this Heritage Coast. Walk north to Ynyslas Nature Reserve or south towards the Georgian harbour town of Aberaeron. The dunes at Ynyslas are spectacular, with their abundant wild flowers in spring and summer including clusters of orchids. Further up river, the reserve is a feeding ground for large flocks of wading birds so make sure to take your binoculars on walks in this area. Although amateur bird watchers may be flummoxed by the similarities of some of the waders, their beauty is entrancing - whether poking at the sand with their long sharp beaks or flitting around showing flashes of white under their pointed wings. 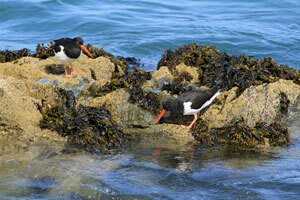 Oyster Catchers are easily identifiable, however, with their distinctive high-pitched call, black and white plumage and red bills. 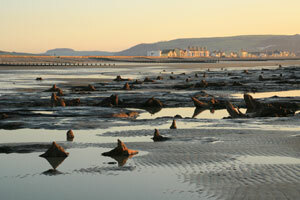 Look out for the submerged forest at Borth: stumps of tree trunks still anchored in the peat below the sand are now known to have died between three and five thousand years ago, bearing testament to the effects of rises in sea level. These lost lands, which are only visible at low tide, could be part of the inspiration for the famous story of the lost land of Cantre'r Gwaelod (Lowland Hundred). Several versions of the myth date back to the mid-13th century but all tell of a country which is submerged after the floodgates in the wall defending it from the sea are negligently left open one night. From the top of Constitution Hill in Aberystwyth, there is a path that runs all the way through to Clarach and on to the coastal resort of Borth. 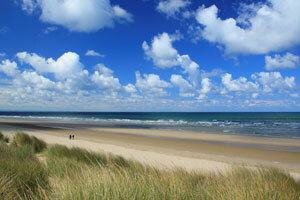 The coastal path runs for 8 km along the coast; with one or two hills, it is a very pleasant walk of about two hours. If you're only walking in one direction, you can complete the circuit by taking either the train or number 512 bus between Borth and Aberystwyth. There are self-guided tours around the town available also. 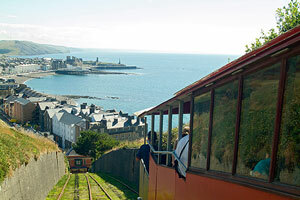 The longest funicular railway in Britain, Aberystwyth Cliff Railway was a grand Victorian addition to the landscape of the bay and a way of ensuring that everyone had to chance to visit the summit of Constitution Hill to view the panorama encompassing the Preseli Hills, Cardigan Bay and Snowdonia. There is a café at the summit and you can spend a glorious time gazing into the famous Camera Obscura in which a mirror revolves, giving detailed views of the surrounding countryside – a magical experience for adults and children alike! Book your tickets in advance for a ride on the popular Vale of Rheidol Railway, a narrow gauge railway that climbs over 600 feet on its journey from the town to Devil's Bridge. The one hour journey traverses spectacular scenery and it’s great to sit in one of the open sided summer carriages as the train ascends a steep gradient, passing through woods and fields. Devil's Bridge features three bridges built one on top of the other, each spanning the deep gorge, the highlight of which is a fabulous waterfall: always better after a spell of heavy rain, of course. The original bridge was built either by the Cistercian monks or the Knights Templar. There are many paths leading down from either side of the bridges to the valley floor. A warning that the climb back is not for small children, the elderly or infirm as it is very long and steep and where there are man-made steps, these are on a giant scale. Why not take the children to The Silver Mountain Experience at Llywernog and experience the spooky Black Chasm and Woo Hoo Wood. For a straightforward history tour, you can join the Miners’ trail and underground mining history tours. The nature reserve at Bwlch Nant yr Arian with its Red Kite feeding station, café and shop is in a spectacular location with an expansive view down the valley towards Aberystwth. Ystwyth Trail - 34 km river valley trail from Aberystwyth to Tregaron. 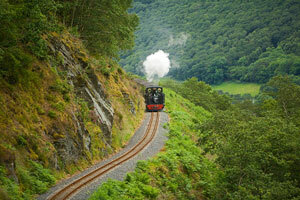 Rheidol Trail - 28 km cycling route from Aberystwyth Harbour to Devil's Bridge. Bwlch Nant Yr Arian - A selection of exciting mountain bike trails, plus a variety of other activities, are available at this forest visitor centre. The Continental Tyres Syfydrin Trail is one of the most scenic wilderness trails in the UK with mountain climbs and river crossings. Looking for somewhere to stay in Aberystwyth?